A rare celestial event was captured by Chandra as Titan crossed in front of the X-ray bright Crab Nebula. 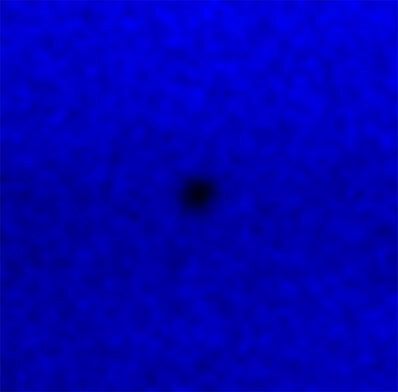 The X-ray shadow cast by Titan allowed astronomers to make the first X-ray measurement of the extent of its atmosphere. Credit: NASA/CXC/Penn State/K.Mori et al. 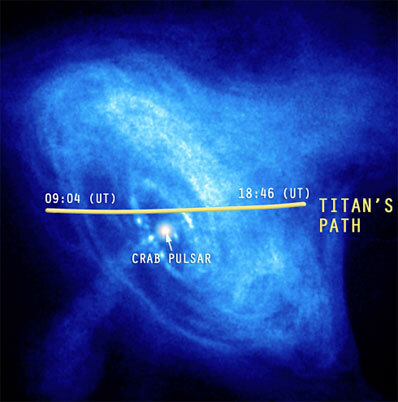 This graphic shows how closely to the Crab Nebula's center Titan passed during the transit. Although Titan passes within a few degrees of the Crab every 30 years, it rarely passes directly in front of it. Credit: Titan's Path: NASA/CXC/Penn State/K.Mori et al. ; Crab Nebula: NASA/CXC/ASU/J.Hester et al. "If Titan's atmosphere has really expanded, the trajectory may have to be changed," said Tsunemi.